The Liberty Seated half-dime series is the smallest denomination of the Liberty Seated design by Christian Gobrecht. 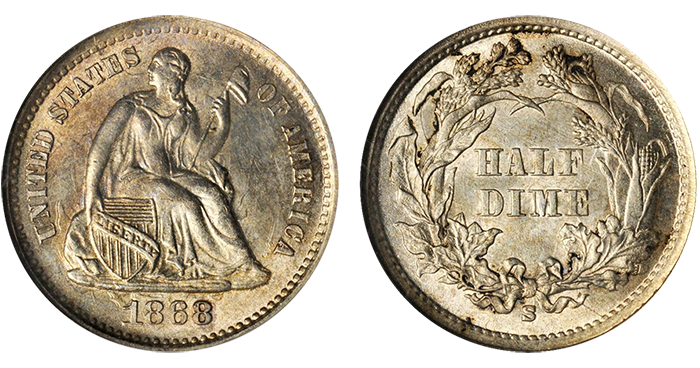 First introduced in 1837, Liberty Seated half dimes were struck until the denomination was discontinued and replaced by a larger coin struck in nickel in 1873. The series is generally considered to be the easiest to complete out of the various denominations with this design, but there are still several stoppers that are either expensive or rare, particularly in higher grades. Yet, a collector on a budget should have little trouble adding some interesting Liberty Seated half dimes to his or her collection for less than $100 apiece. In this article we will take a look at five options that won’t break the bank yet provide lots of collecting fun. The Liberty Seated half-dime series was first struck in 1837, replacing the Capped Bust design. Initially, no obverse stars were in the design, making for a plain yet appealing coin. In 1838, however, obverse stars were added, making the 1837 (and 1838-O, also without stars) a separate type. A total of 1,405,000 pieces were struck for circulation the first year of issue, and while survivors are scarce in higher grades, lower-grade examples are generally available. For $100 you should be able buy a decent and original Fine, and such a coin would make for a good representative of this very short-lived design that is as close to the original as Christian Gobrecht originally had designed it. 1837, No Stars, EF-45 with obverse toning. Spend a little more: This type is available in most grades, and you can go for higher-graded coins, including Uncirculated examples, as your budget allows. If you want to spend a little bit more than $100 a nice and original Very Fine or even Extremely Fine graded piece is certainly a possibility. 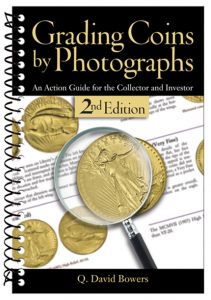 Such coins will set you back about $150 to $250 at those grade levels. In 1853 the weight of American silver coinage was lowered slightly to make sure that the value of the silver in them was not more than the face value of the coins. In order to make this readily visible, arrows were added next to the date. These would remain from 1853 until 1855, after which the arrows were removed again. While not particularly scarce, this certainly is an interesting type, and a complete type set of 1853 to 1855 With Arrows coinage is a popular subset of Liberty Seated coins to collect. For the smallest silver denomination, $100 will buy a nice About Uncirculated, making this an affordable type coin. Spend a little more: Both the Philadelphia and New Orleans mints struck this type in 1853. Of the two, the New Orleans Mint struck far fewer coins, and the issue is considerably scarcer. Yet, for only about $150, you should be able to find a very nice EF/AU example struck at the New Orleans Mint, making for a very scarce yet affordable example of this type. The New Orleans half dime of 1860 is the final coin of the denomination struck at the Southern mint, which would close the following year after the outbreak of the American Civil War and would not reopen until half dimes had been discontinued. A semi-scarce date with a mintage of 1,060,000 pieces, many of these were hoarded during the war when silver was in short supply and was saved due to the uncertain times. Another fact that this coin has going for it is that it is the only date of the redesigned half dime (the legend was moved to the obverse in 1860, and the reverse has a different wreath) struck at the New Orleans Mint. With all that said, $100 will find you a very nice looking EF or even an AU, and would make an excellent buy. Spend a little more: As mentioned, many were hoarded, and high-grade pieces are not as scarce as the mintage figure would lead one to expect. While lower-graded Mint State pieces will cost about $300 and up, a very nice-looking AU-58 with just a hint of rub on the highest points will cost less than $200 and makes for an excellent buy. Mintages of most silver coins dropped sharply during and immediately after the American Civil War. This was even the case at the San Francisco Mint, despite its being far removed from the battlefields. Most half dimes from the 1860s are very scarce, and while the 1868-S is one of the most readily available, it remains quite scarce. Personally I like this date because of the mintage of just 280,000 pieces—which, when it comes to coins, is in fact quite low. With a little bit of searching a nice looking EF or low-end AU can be found for right around $100, and thanks to the relatively low mintage and overall scarcity of half dimes from the 1860s, I believe that’s an excellent buy. Spend a little more: This date increases substantially in value once you reach Uncirculated grades, and once you get to the MS-65 level this date readily sells for a few thousand dollars. Your best bet, for about $200, is to find an AU-53 or AU-55 with fully original surfaces, which provides a lot of coin for the money. 1873 was the end of an era. The Philadelphia Mint had been striking nickel five-cent pieces since 1866, and by 1873 it was time to say goodbye to the tiny silver half dime. As a farewell, the Philadelphia Mint struck 712,000 pieces, but it is unknown to what extent these circulated. They are readily available in most grades today, and $100 will get you a very nice-looking AU with just a little bit of wear on the highest points.